This carrier clamps to your A-frame trailer to provide an elevated hitch for transporting any bike rack with a 2" shank. Powder coated steel rack adjusts to provide maximum clearance for your propane tanks. 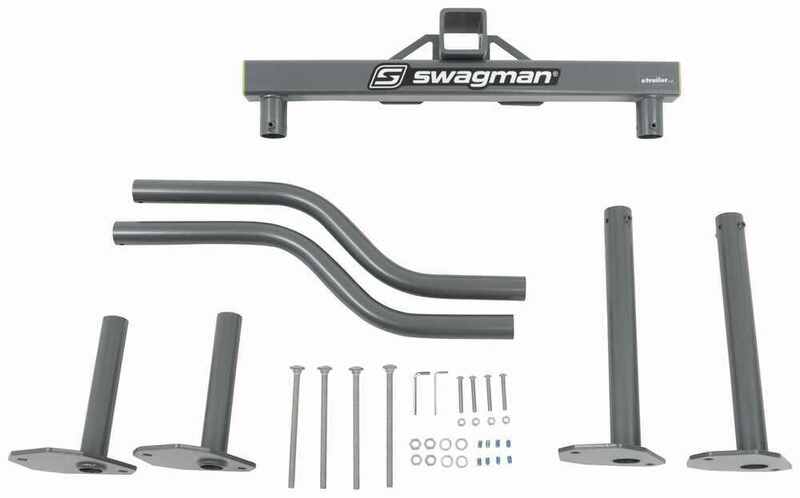 Lowest Prices for the best rv and camper bike racks from Swagman. 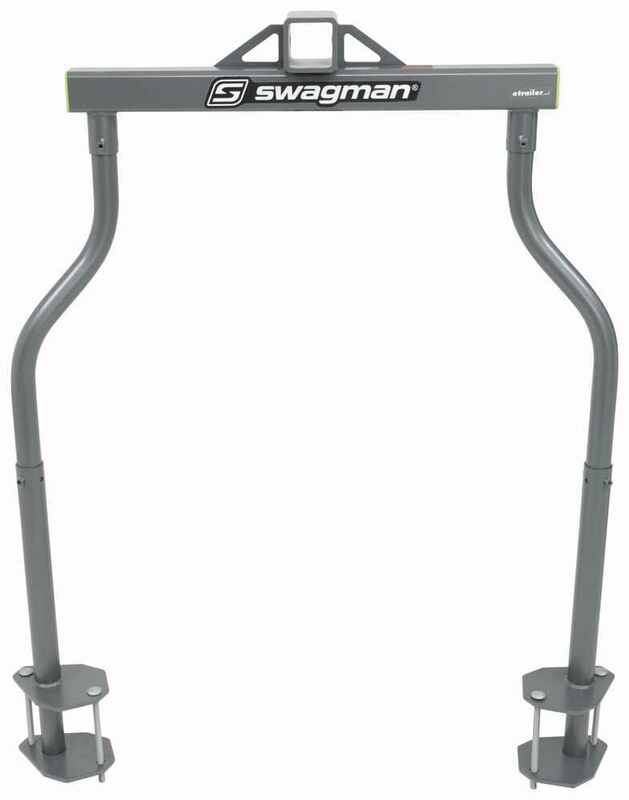 Swagman Straddler - 2-Bike Carrier for A-Frame Trailers part number S80503 can be ordered online at etrailer.com or call 800-298-8924 for expert service. This carrier clamps to your A-frame trailer to provide an elevated hitch for transporting any bike rack with a 2" shank. Powder coated steel rack adjusts to provide maximum clearance for your propane tanks. Height from bottom of hitch: 29-1/2" - 35-1/2"
Width of upright (center to center): 10-1/2" - 31"
The popular wheel mounted bike rack is now available for your RV bumper! 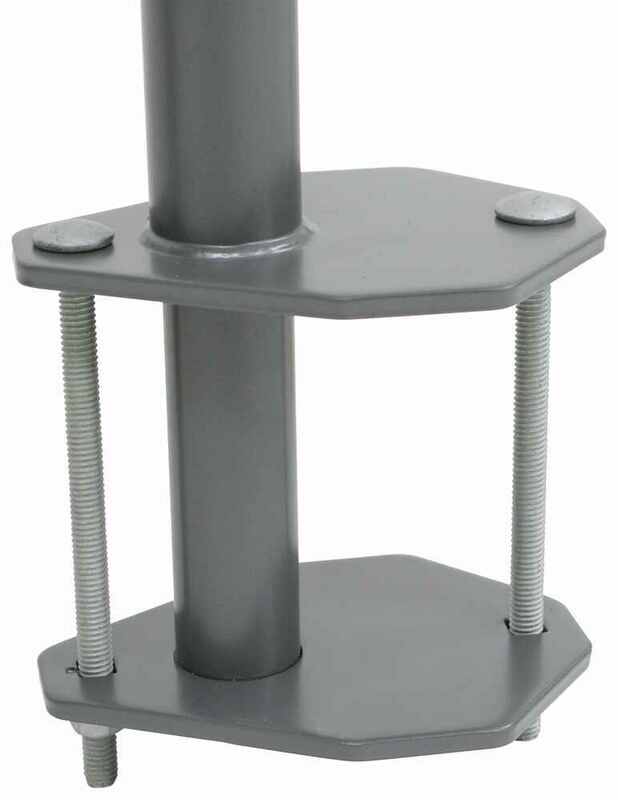 Simply secure the steel U-Bolts provided with the rack to your bumper. 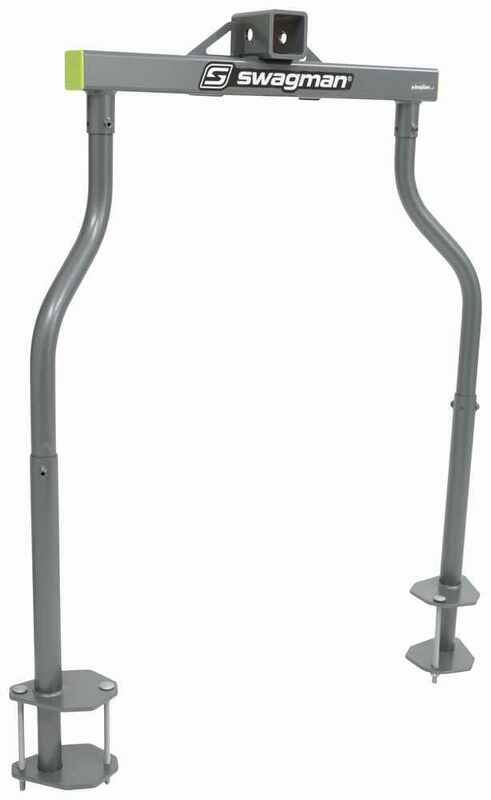 The upright bar in the center of the rack gives added support to your bikes while towing. This bike rack installs on your A-frame trailer and lets you carry 2 bikes of almost any size or style by the wheels - no adapter bar needed. Keeps your bikes safely behind your tow vehicle where you can see them. Foam bumpers protect bicycle finish. Heavy-duty hitch rack lets you carry 4 bikes on premium SuperCush anti-sway cradles with ZipStrip ratcheting straps. Dual arms provide excellent bike stability and fold down for storage. Includes locking hitch pin and integrated cable lock. 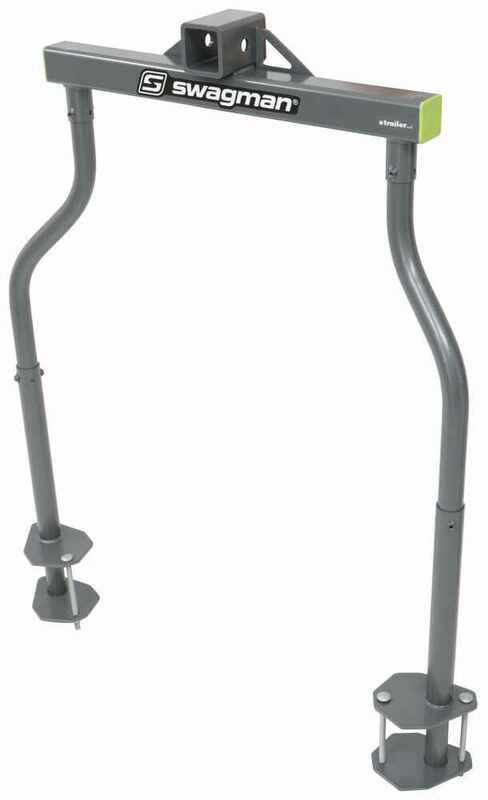 Curt Adjustable Trailer Hitch Receiver - 18"-51" Wide - 2" Drop - Class III - 2"
Order: RelevanceNewestRating - High to LowRating - Low to High This carrier clamps to your A-frame trailer to provide an elevated hitch for transporting any bike rack with a 2" shank. Powder coated steel rack adjusts to provide maximum clearance for your propane tanks. Do you have a question about this RV and Camper Bike Rack? 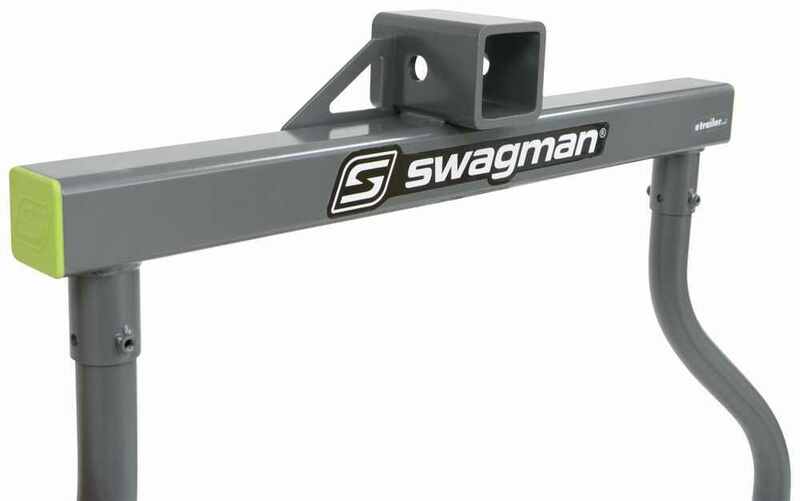 Since you only have 2.5 inches of available space on the frame of your a-frame trailer the Swagman part # S80503 won't work BUT I have a great solution instead. Check out the Jack-It 2 Bike Rack for A-Frame Trailers # LC429756. This attaches between the trailer jack and the trailer instead so your limited frame clearance would not be an issue. 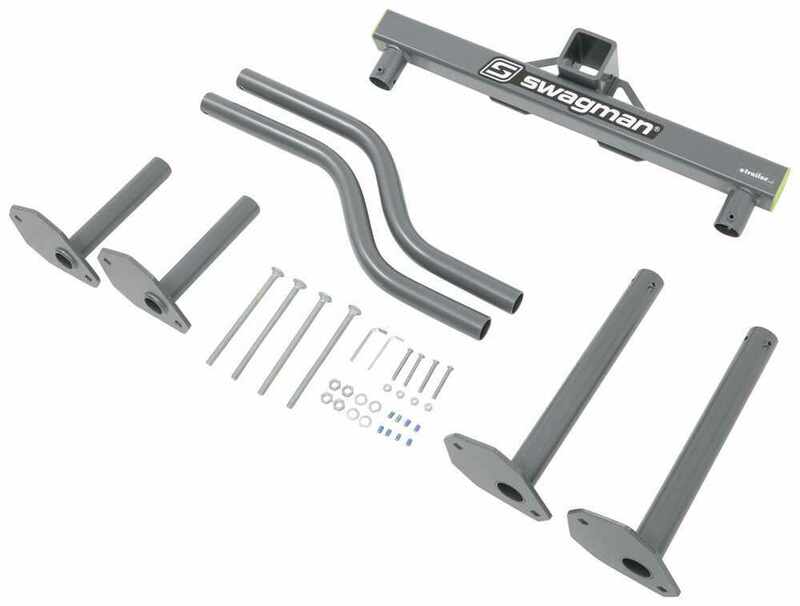 The distance from the top of the trailer frame to the top of the horizontal bar on the Swagman Straddler part # S80503 is adjustable from 29-1/2" - 35-1/2". I have attached a photo to assist as well. Highest quality rv and camper bike racks for the best price. Most detailed, accurate rv and camper bike rack information available.